Line a 9x9 pan with foil. butter the foil lightly. 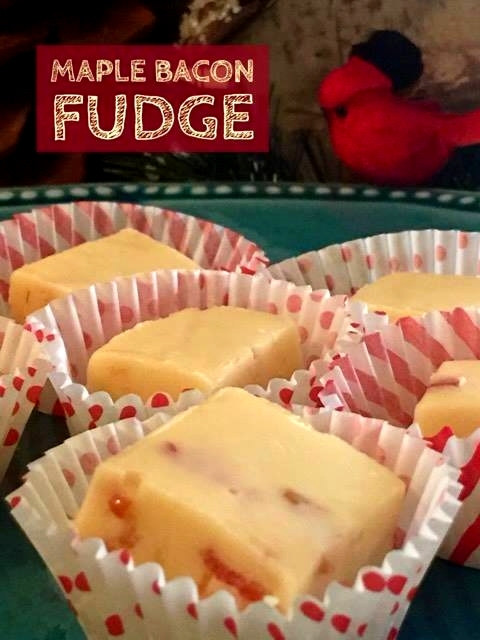 In a large microwave proof bowl, place the butter cubes, white chocolate chips, sweetened condensed milk and maple flavoring. Heat on high for one minute. If the mixture is not completely smooth when you stir it, continued to melt it at 30 second intervals until it is. Mine took an extra minute to get to the right consistency after the first minute. Stir in the crumbled bacon pieces to the melted chocolate mixture and stir well. Pour into the prepared pan and allow it to set up in the fridge for at least 2 hours before lifting out of the pan, removing the foil and cutting into pieces.